Is there any point reviewing a ten year old novel that's been a massive popular best seller from a critically acclaimed author and is soon to be turned into a blockbuster movie? 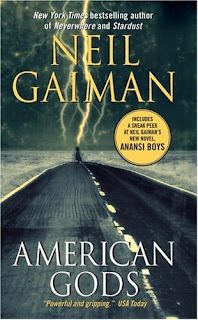 Well when you put it like it there probably isn't: American Gods has been praised to the skies and its sold in the millions and Neil Gaiman is an intelligent, charming and personable fellow. I met the chap once and I liked him. I've enjoyed other Neil Gaiman novels and of course I'm a fan of his classic comic, The Sandman. My copy of American Gods is covered with reviews and there's even a Q&A section at the back of the book for use in book groups. By any standards this is a successful book. And yet? And yet I didn't like it very much at all. The central premise was good and some of the scenes were executed beautifully, but in general I thought American Gods was pretty poor. The main idea is this: as immigrants arrived in America from Europe they brought their gods with them - these gods became manifested through the immigrants' belief in them and the more people believed in the gods the more powerful they became. We follow a character called Shadow as he is released from prison and gets a job working for a down at heel Odin who isnt very popular anymore. I like this notion but unfortunately the novel spirals out of control pretty quickly after that. Shadow's wife is killed and comes back as a ghost, a leprechaun character is introduced and is only interested in drinking and fighting, Television has become a god and is somehow manifested through Lucille Ball who in a yucky scene attempts to flash Shadow on a motel room TV. The book just gets sillier after that until I was skipping pages and wanting the whole thing to end. There was a bit of a Terry Gilliam vibe working here - bad bloated indulgent Terry Gilliam not dangerous, funny inventive TG. And it made me wistful for the book Gaiman wrote with Terry Pratchett, Good Omens; I wished he'd written this one with Pratchett too as we would have had Gaiman's enjoyable premise enlivened with some good comedy. The tone of American Gods is uncertain, neither gothic nor comedic nor naturalistic and it is not brilliant enough to have become sui generis. Gaiman's aesthetic role model for his big American novel seems to have been Stephen King but I really wish he'd stayed closer to his English roots and chanelled Pratchett, Douglas Adams, and PG Wodehouse instead. And yeah I appreciate that this is a minority view but thats why you come to this blog isn't it?